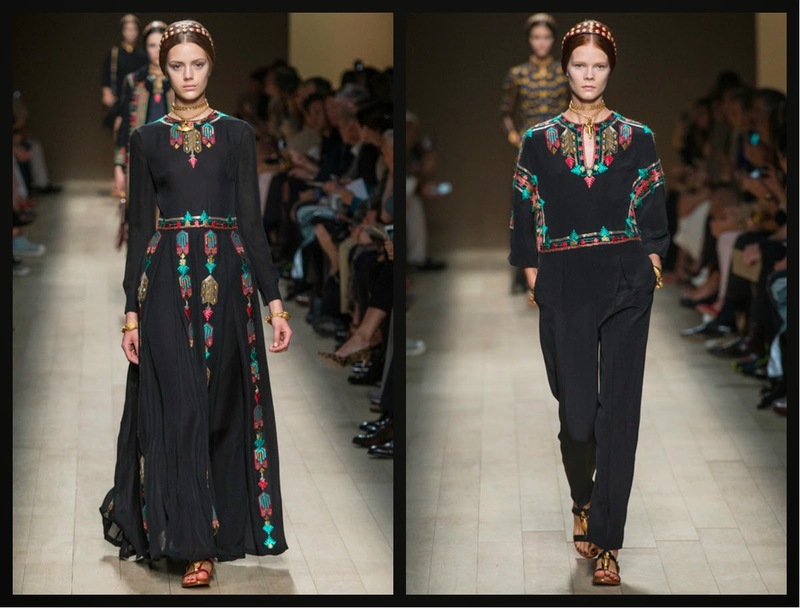 Valentino head designers Maria Grazia Chiuri and Pierpaolo Piccioli adorned opera as their source material last season. 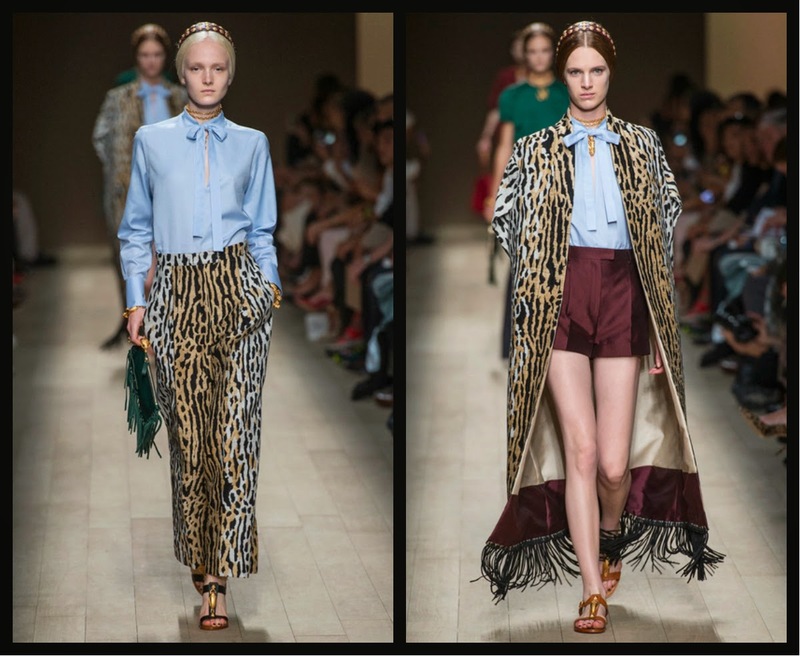 This source of material can merely be described as a well-traveled fringed cape laden with turquoise, coral and red all embellished in a pattern hard to put a finger on. 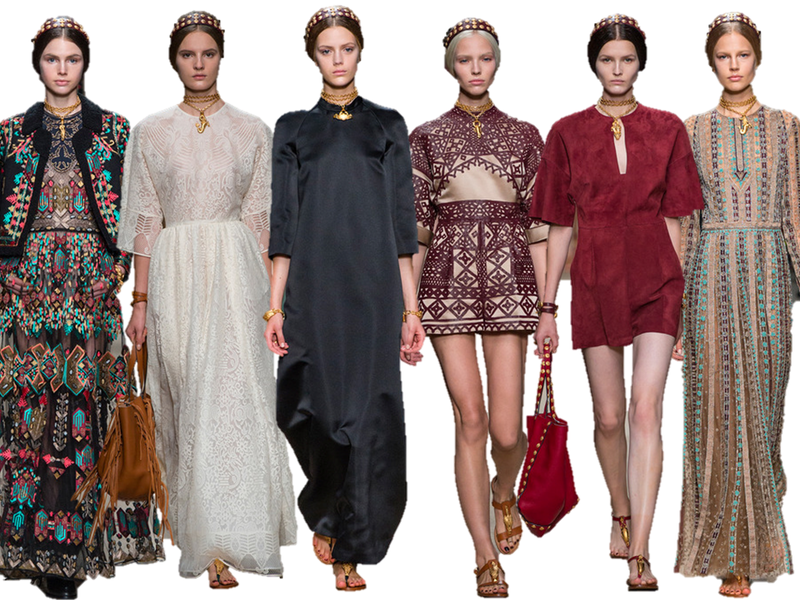 Maybe Grecian? Egyptian? Moroccan? Aztec? Where? Perhaps, from somewhere else in North Africa? 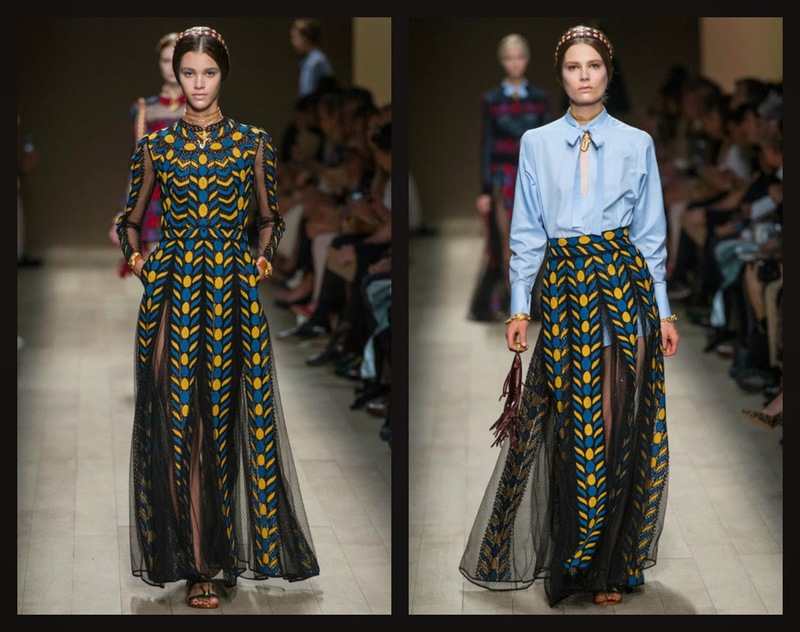 Visibly, the classic opera is literally pinned on the mood board of this ss14 collection. 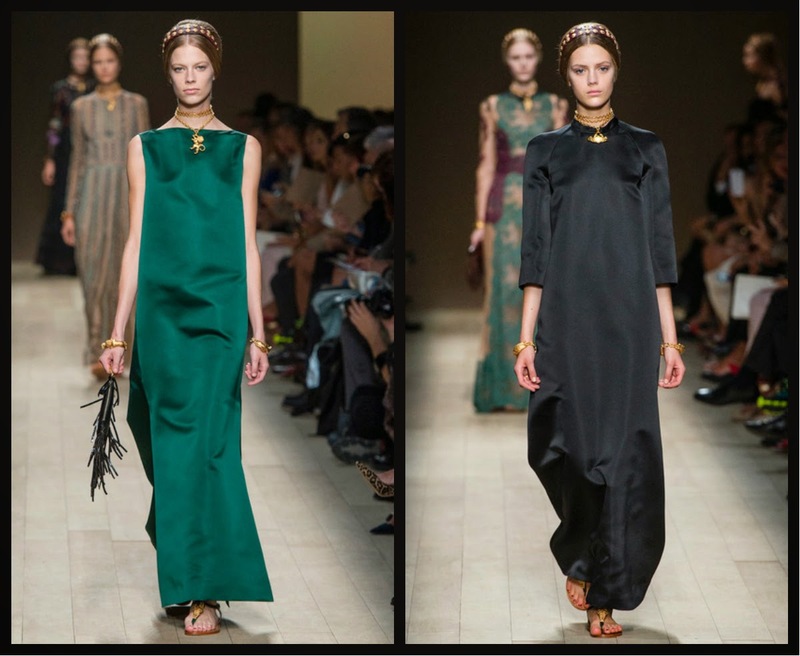 The Valentino damsel is no longer a girl with a pearl earring, rather, one with a mythical aura. 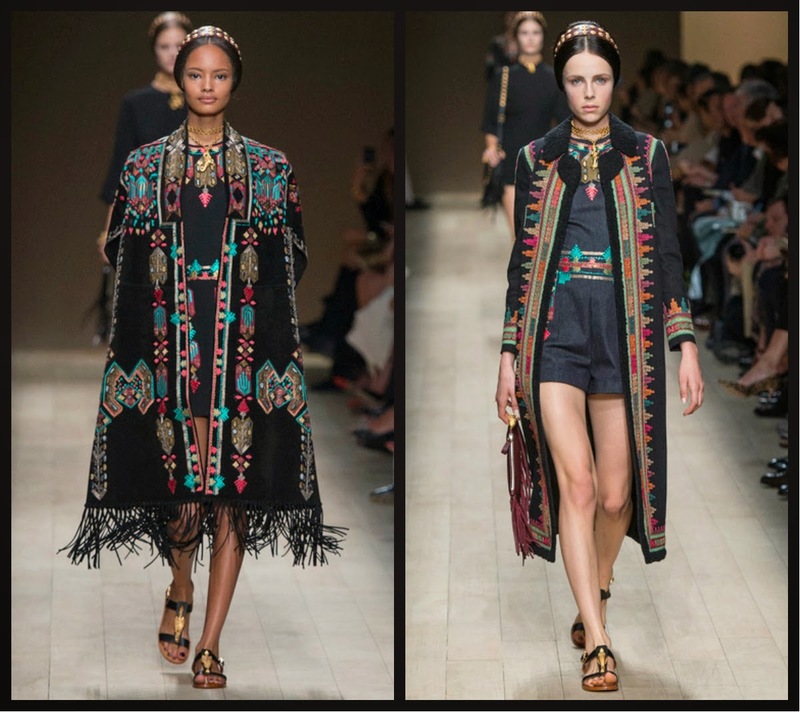 It’s so evident what distinguishes today's Valentino woman and why so many strive to be like her. 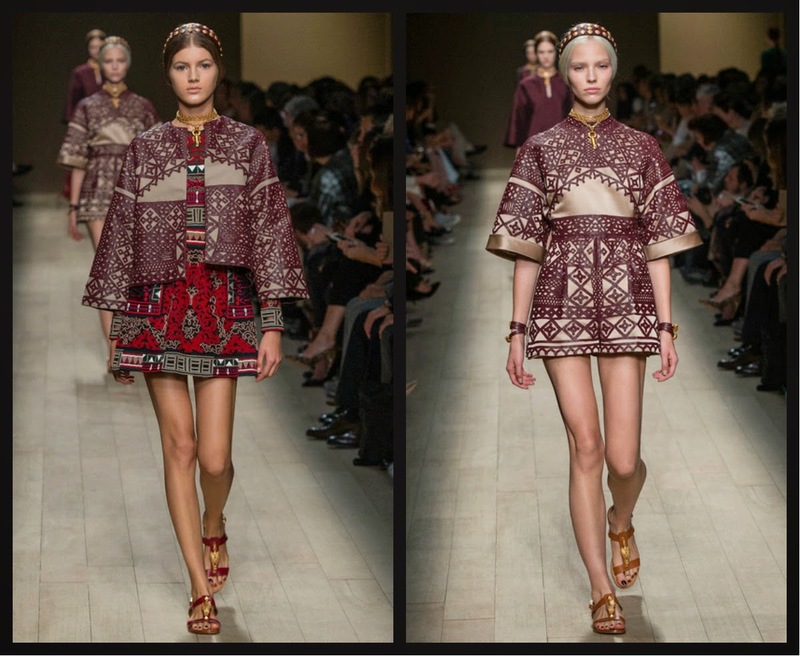 This was portrayed by serenity and self-possession in the faces of the models, each of whom looks like a floating image of some historical portrait straight from Ancient Roman or Greek times. 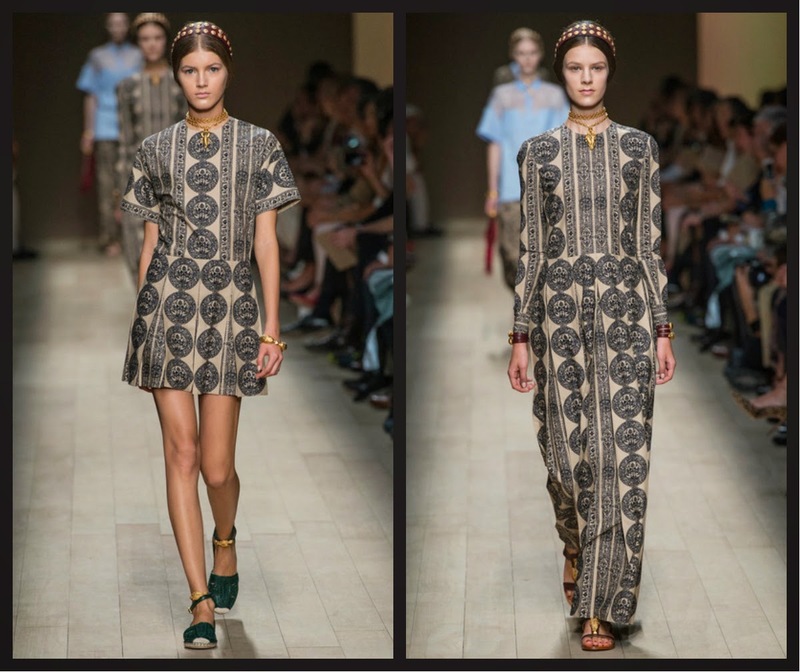 For this spring/summer '14 season, the Valentino damsel adorns minimal antique gold-studded leather circlets in her hair, gold chains, mythical-beast pendants wrapped at their throats and struts away in a pair of flat Greek sandals. Some of the colourful emrboidery is reminiscent of patterns from the Aztec region. 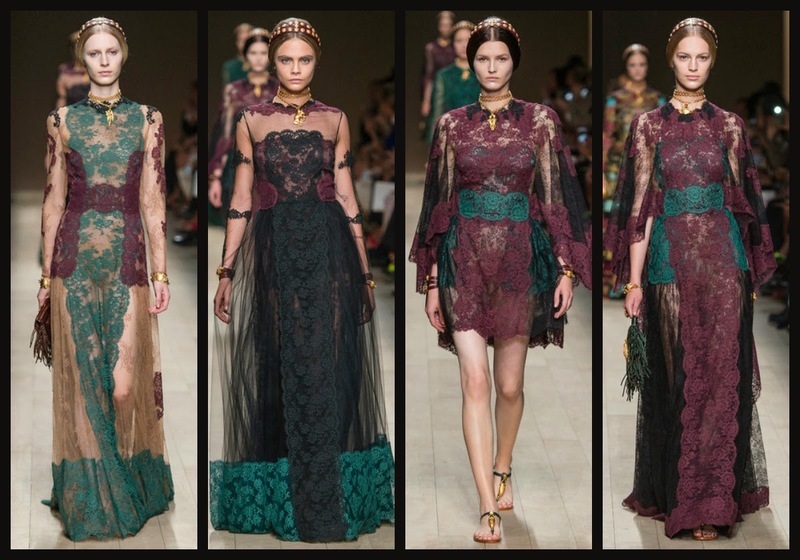 In this SS14 collection, innocence was replaced by something dark and mysterious. 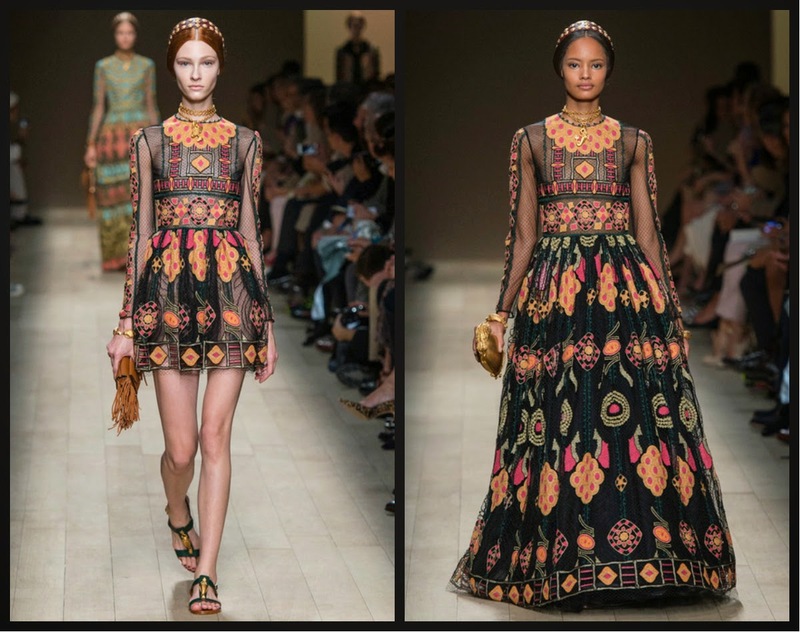 These 2 aspects brought richness to the detailed silhouettes. 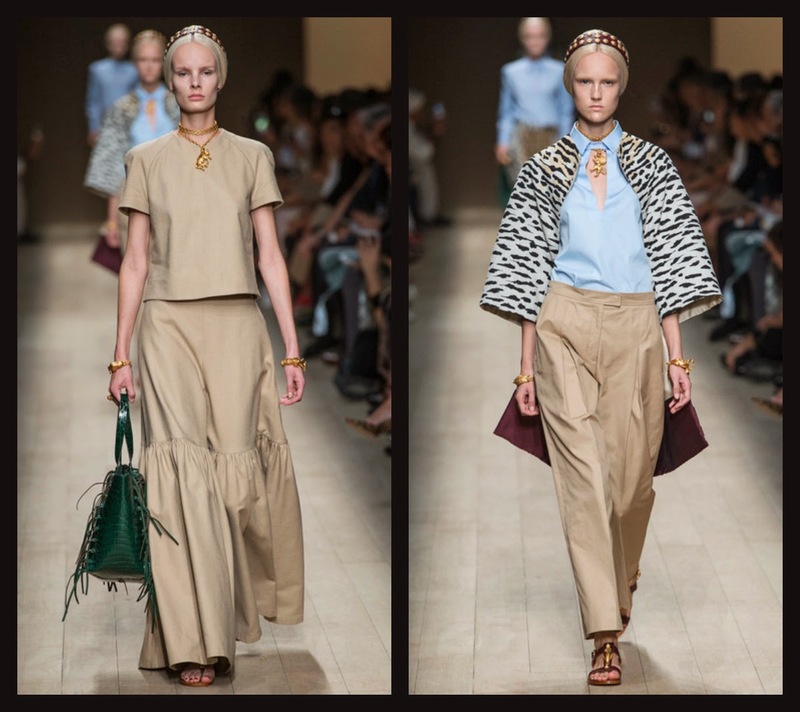 The flat sandals with golden scarabs that adorned the runway put more emphasis on the realness of the collection. 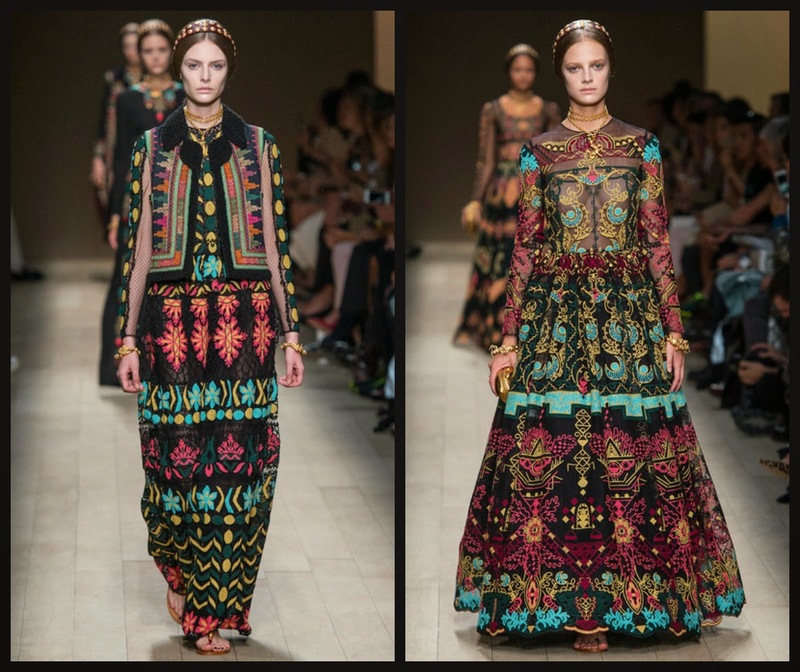 The beautiful embellished dresses with brightly colored details looked very indigenous with potential to hold a strong appeal to those with Bohemian souls. 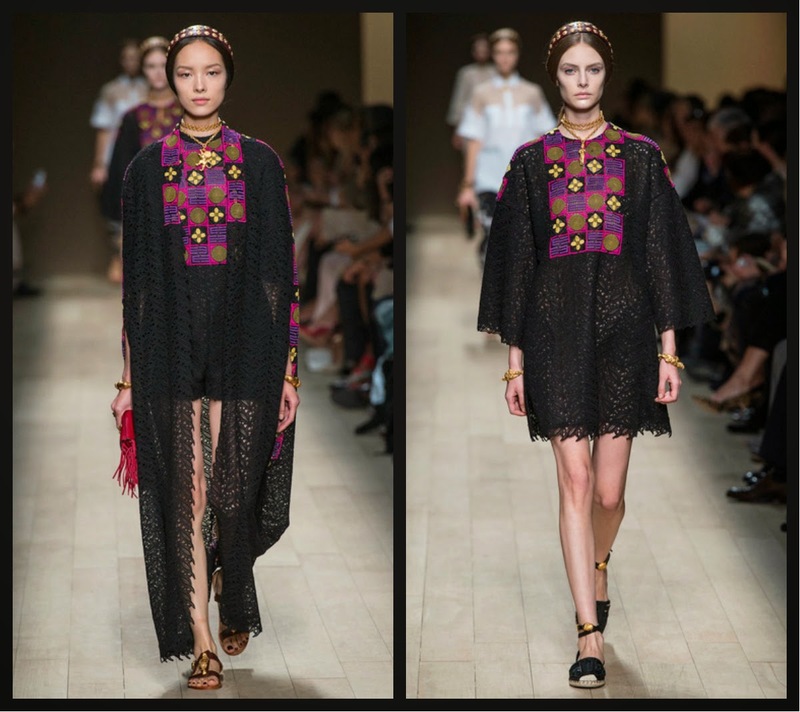 Everything from the ornate pieces, dresses patched together from silver armor squares and the monastic romper in organza embroidered with tiny strips of leather that holds this collection will resonate well with boho spirits and complement their inner most mysterious feelings. 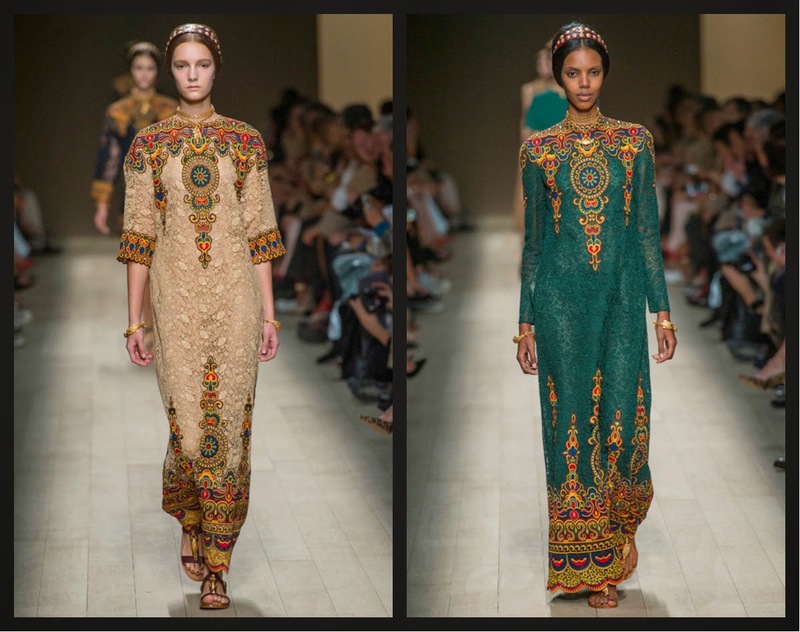 Detail was very key in this collection as you will notice the impeccable detail on the runway which was hand-painted canvases by a man who does theater sets in Rome. 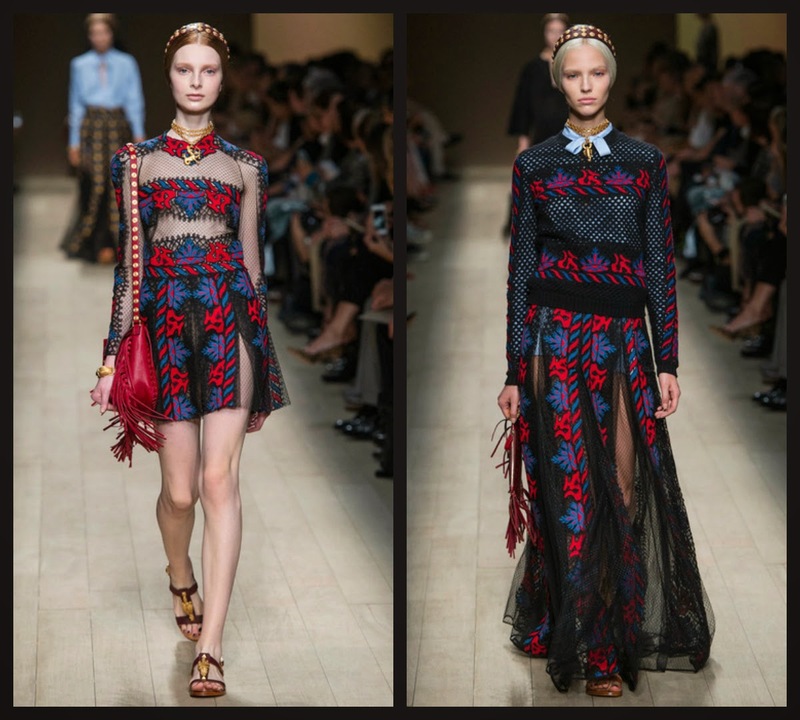 All in all, the theatrics of the Valentino SS14 collection absorbed the exquisite opera detail in everything. 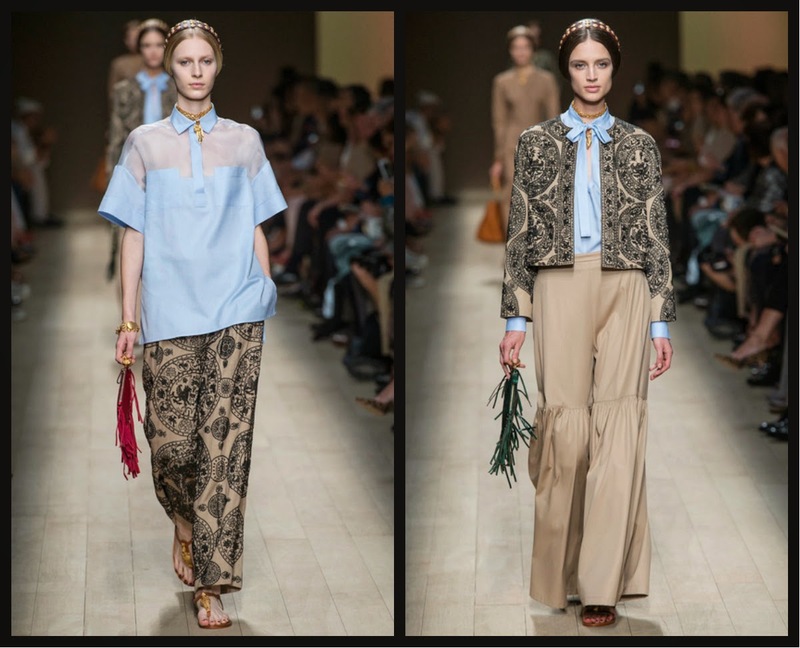 With Maria Grazia Chiuri and Pierpaolo Piccioli's immense talent for accessories, this led them to come up with basket-woven, raw-fringed techniques for bags with the inclusion of releasing a section of fringed suede which was part of this collection as well. 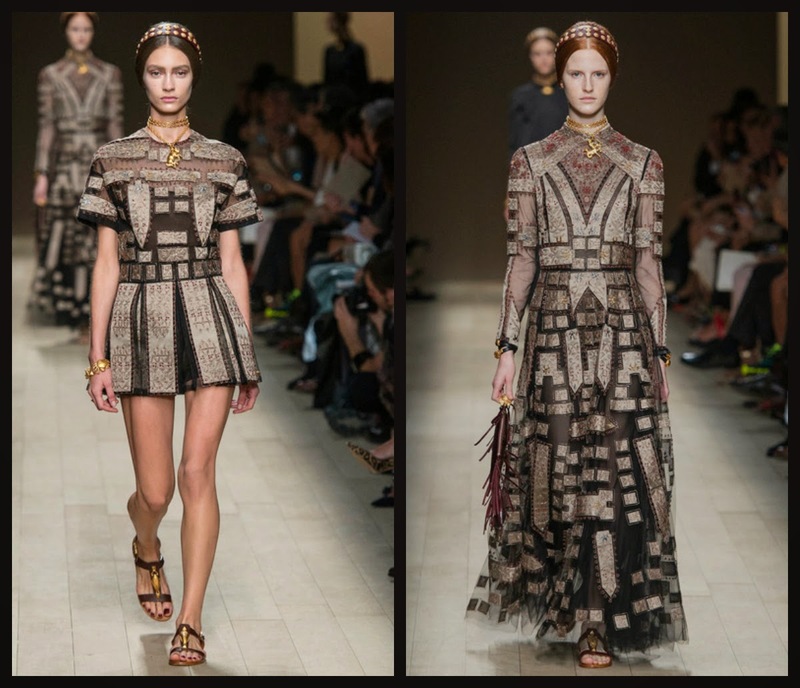 Their Valentino ss14 collection was delivered on a calm continuity platter. 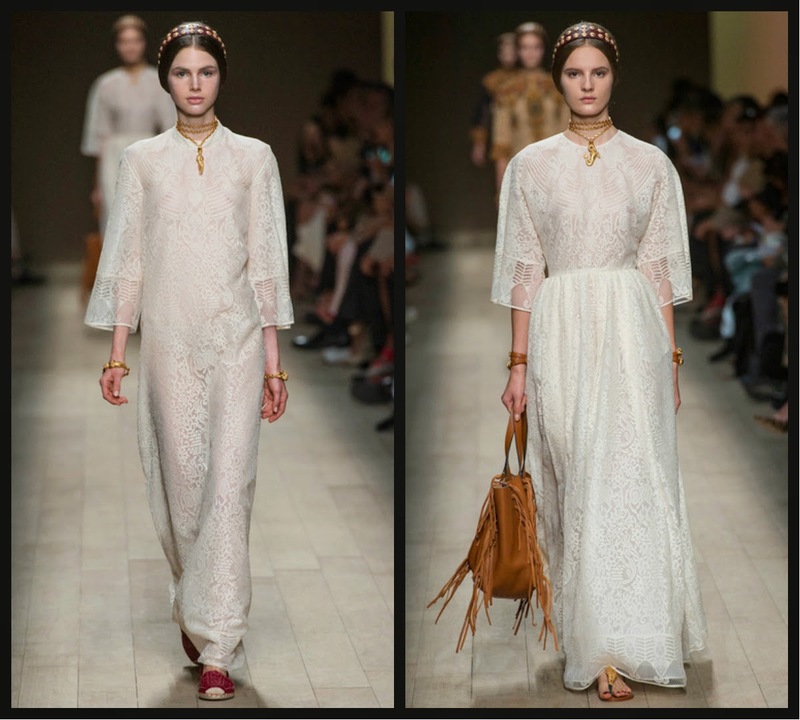 This is visible in how they turned a long, chaste dress, lace, flower embroidery to an adorning and interesting piece. These cheerful, experienced and sensitive Romans have won over us here at AfroPino as well as their ever growing international crowd. 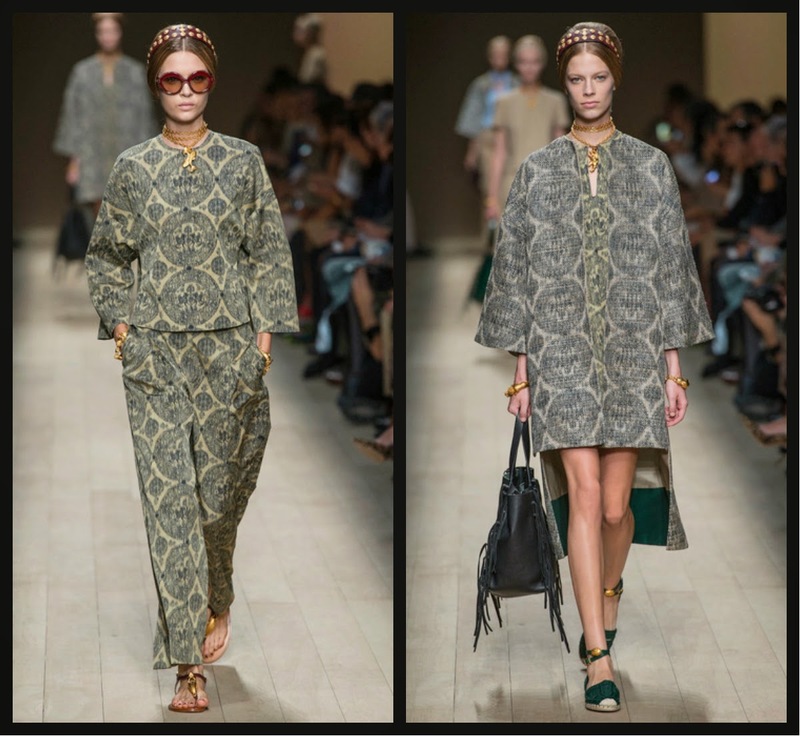 Grab a cuppa and enjoy Chiuri & Piccioli's demonstration for their spring/summer'14 couture in these curated images. 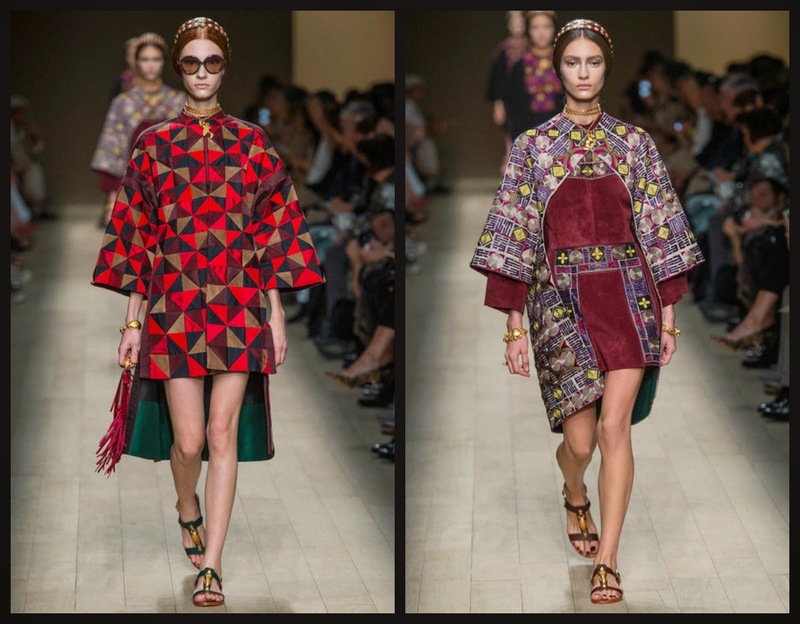 Stark robes, stately golden jewelry, opera house inspired delving and drawings into the costumes will certainly be the epitome of Valentino woman this spring and summer. If you caught the drift of something ancient and primal in this collection, you were right. 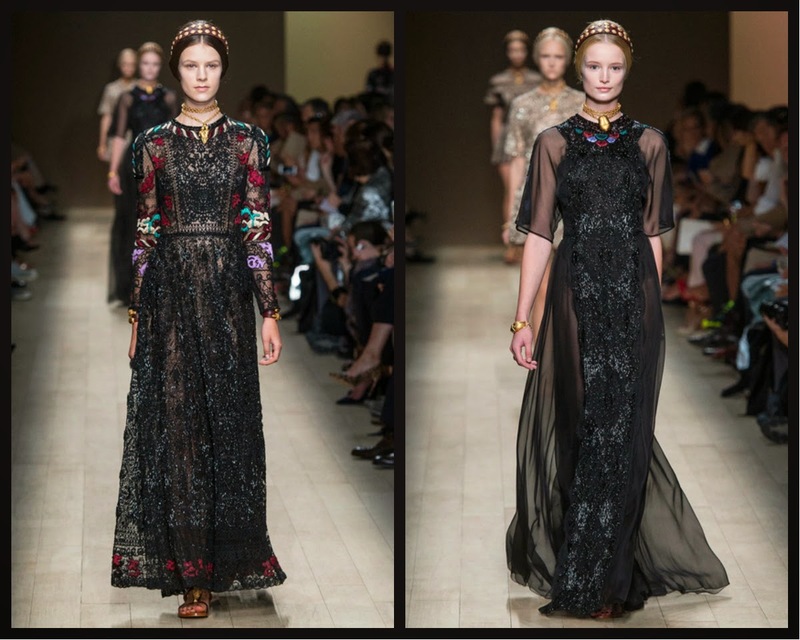 "It's a fashion opera. A show has to be a show." 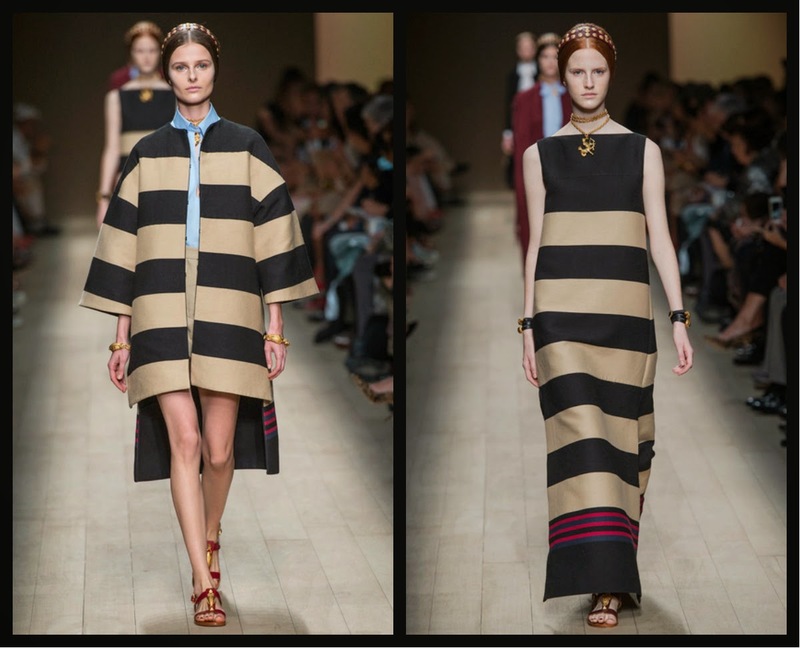 Clearly, Maria Grazia Chiuri and Pierpaolo Piccioli immersed themselves in opera as they were designing this collection. 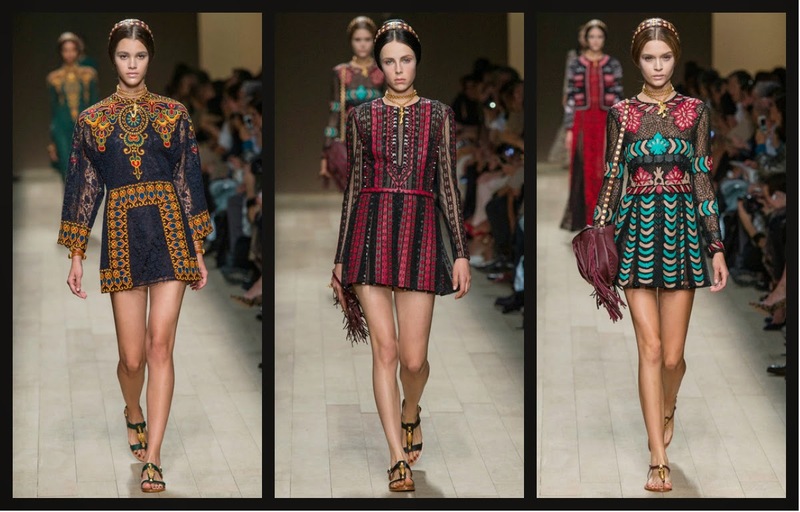 Valentino Spring/Summer 2014 collection demonstrated excellence. 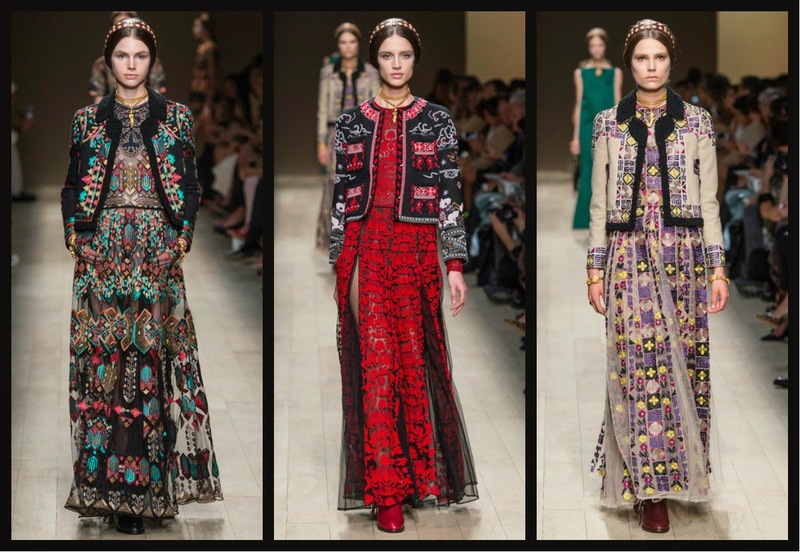 Maria Grazia Chiuri and Pierpaolo Piccioli took a mere captivating silhouette, added magical embroidery, literally like a whole Garden of Eden splattered that on a skirt, jump-suit, long & short dress whilst still maintaining that signature Valentino innocent romanticism. 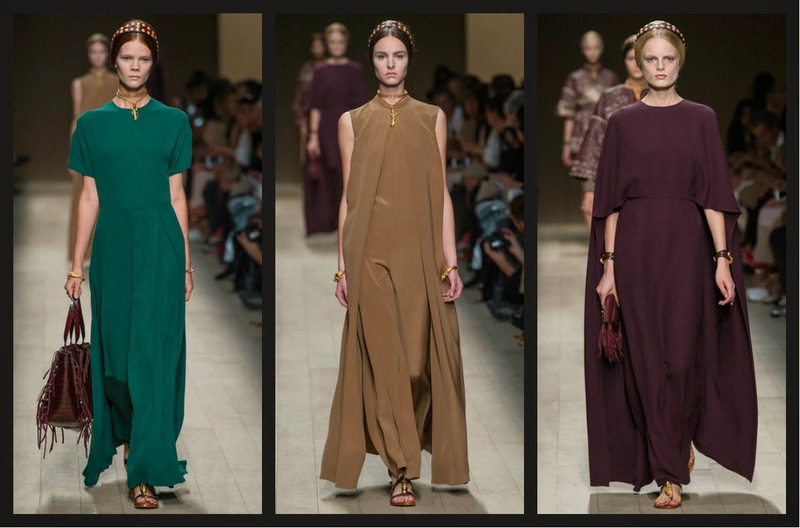 Far more interesting is the elegance of the plain, simple and completely bare amazingly cut columns that came in black, light brown, maroon and green. 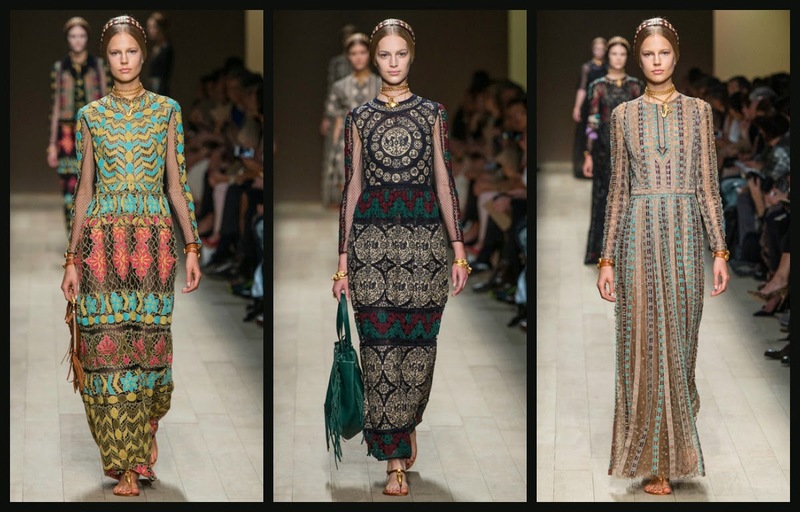 Wonderful collection of dress. these was really awesome and cute.